Medulla of thymus. Light micrograph of a section through the medulla of a healthy thymus. The thymus is a gland at the base of the neck that is involved in the development of the immune system. At left is a Hassal's corpuscle (purple oval), an obscure cyst-like structure that may be a degenerated epithelial cell. At upper right is a blood vessel. 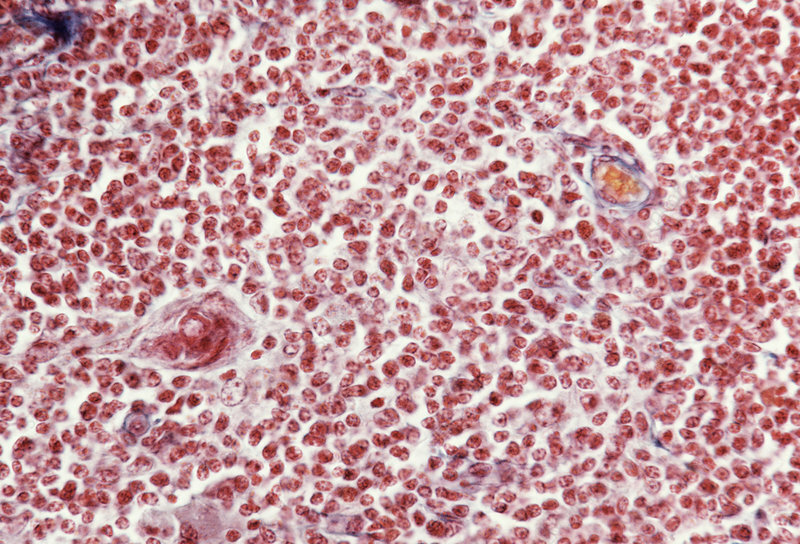 Within the tissue of the medulla are maturing T-lymphocytes (dark red), a type of immune cell. They migrate into the medulla from the thymus's outer cortex, before re-entering general circulation. Magnification unknown.